The Woodland Trust is calling for amendments to the HS2 Bill to ensure ‘every step’ is taken to prevent the unnecessary loss of ancient woodland, and set a template of best practice for future infrastructure provisions. When HS2 Ltd first published its original environmental statement in November 2013, the company failed to identify all the ancient woodland that would be affected by the construction of the new high speed train line. 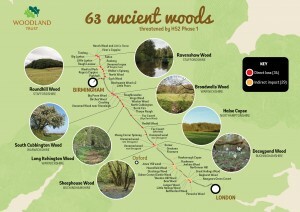 In the time since, the Woodland Trust has identified an additional 14 ancient woodlands that will suffer direct loss. The total number of ancient woods to suffer direct loss now stands at 34. Another 29 will be indirectly impacted by noise pollution, lighting and dust. “As HS2 is being presented as a green transport solution, it needs to show far more respect for our richest terrestrial habitat,” said James Cooper, Head of Government Affairs. “I think it’s more about priority and rigour in methodology,” he added. While it is now too late for major changes to the location of the route, Cooper hopes that in the context of its high political profile, these mistakes will be acknowledged as such, and that in the final stages of the Bill amendments such as tunnelling will be made to prevent further loss. Among the measures that the Trust would like to see put in place, for this and future projects, is for companies to be held accountable for compiling a clear and transparent table showing each of the ancient woods that would suffer loss. Following that, clear reasoning as to why that loss cannot be avoided (if that is the case), and then a proposal for compensatory planting related to each loss, and how that compensation has been calculated. He also stressed that the idea of fully compensating for the loss of ancient woodland should be removed from such calculations. HS2’s schemata involves a commitment to ‘no net loss’ of biodiversity, but given that ancient woodland is quintessentially irreplaceable – now covering only 2% of the UK – such a commitment is counterproductive. “Ancient woods are the UK’s richest terrestrial habitat for wildlife and are home to more threatened species than any other. They represent the last fragments of the wildwood that once covered our country after the last ice age,” he said. Also on Cooper’s list of asks, is a commitment from HS2 that all ancient woodland will be treated equally. Currently the company makes a distinction between how Ancient Woodland and Planting on Ancient Woodland (ancient woodland sites that have been planted with conifers) is treated, but even planning guidance now recognises these two habitats as equal. The Trust will also ask for more tunnelling wherever possible to minimise unnecessary direct loss. “If we’re looking at embarking on infrastructure projects on this scale,” he went on, “then there has to be robust accountability mechanisms put into place. The Bill will go for a second reading in the Lords on Thursday where its principles will be debated, before entering the committee phase. The Woodland Trust intends to appear before the Lords committee, and remains optimistic that the heritage of ancient woodlands will be given the respect in policy that it warrants. The Lords and Baronesses were not convinced HS2 is appropriate. Needs courage to change a mistaken scheme. More important to restart this project for an affordable approach providing more rail user benefits.